Montreal is Quebec's most populous city, its financial center and a thriving, multicultural hub of life activity. Quebec City, 169 miles up the Saint Lawrence River, is a unique, historical city in the continent of North America. These two French Canadian cities are on most Quebec travel itineraries, so getting from one to the other in the most convenient and economical way is a question many visitors have. Air Canada and West Jet fly between Montreal and Quebec City. The Montréal-Trudeau Airport (YMQ) is about a half hour drive from downtown Montreal. The Québec City Jean Lesage International Airport (YQB) is about 25 minutes from downtown Quebec City. The flight between Montreal and Quebec City takes under an hour, but travelers should arrive at the airport 1.5 hours before their flight is scheduled for departure. Orléans Express is the only regular bus service between Montreal and Quebec City, with stops in between. The buses are large, comfortable coaches that offer free Wi-Fi and personal electrical sockets at each seat. The trip takes three or four hours. A guided tour may be a good idea if you want to make the most of your trip and learn as much as you can. This Quebec City and Montmorency Falls Day Trip from Montreal is a full-day sightseeing tour with a local licensed guide, highlighting Quebec City's top attractions. Another option that allows more time in Quebec City is a two-day guided tour of Quebec City and Tadoussac, leaving out of Montreal. Get a guided tour of historic Quebec City plus time to spend on your own. ​After the scenic drive to Tadoussac, hop on board a whale watching vessel, and keep an eye out for the belugas, minkes, and humpbacks that dwell in the St. Lawrence waters. There are two main options for driving between Montreal and Quebec City, both of which take about three hours. The slightly quicker way is along Highway 20 on the south shore of the Saint Lawrence River; however, this route is dull and lacking charm. One advantage of taking this route is the authentic poutine at Fromagerie Lemaire just outside of Drummondville. Being a cheese making operation, the cheese curds are fresh and the french fries, of course, fresh cut. The north shore route along Highway 40 is slightly more scenic, as it runs closer to the river shore and has more small towns with pretty double-spired churches. Trois Rivieres, about halfway between Montreal and Quebec City, makes a pleasant stop on the north shore. Be aware that driving in Quebec in winter can be challenging, especially if inexperienced. Snow tires are mandatory for Quebec cars for a reason, so educate yourself on proper winter driving. Via Rail is Canada's national passenger railway and provides daily service between downtown Montreal and Quebec City. The train ride is not particularly scenic, but it is comfortable, reliable, and convenient. Passengers may choose between economy and business class. Free Wi-Fi is available on board. 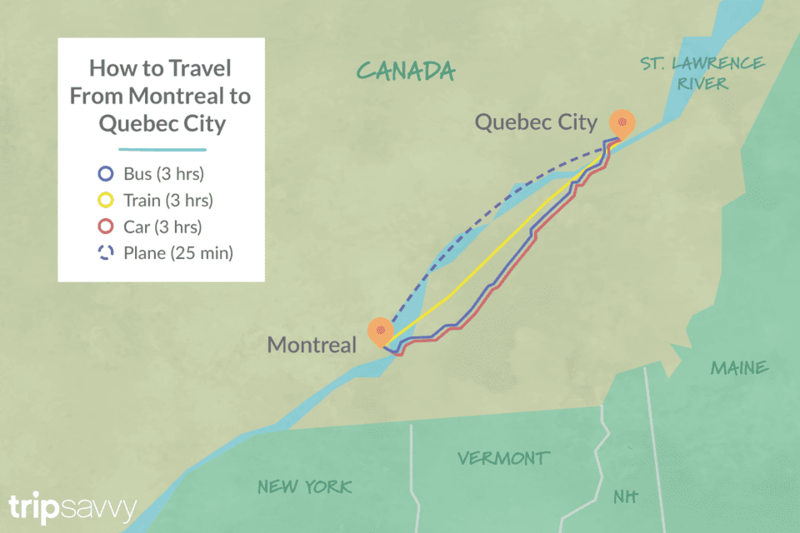 The train trip between Montreal and Quebec City takes between three and four hours. It may not be the way that most people travel between Montreal and Quebec City, but if you have a couple days and a reliable bike, you can follow Michel Gagnon's detailed route itinerary (available in French and English) that takes you through Trois-Rivières, historic communities, and waterside trails.